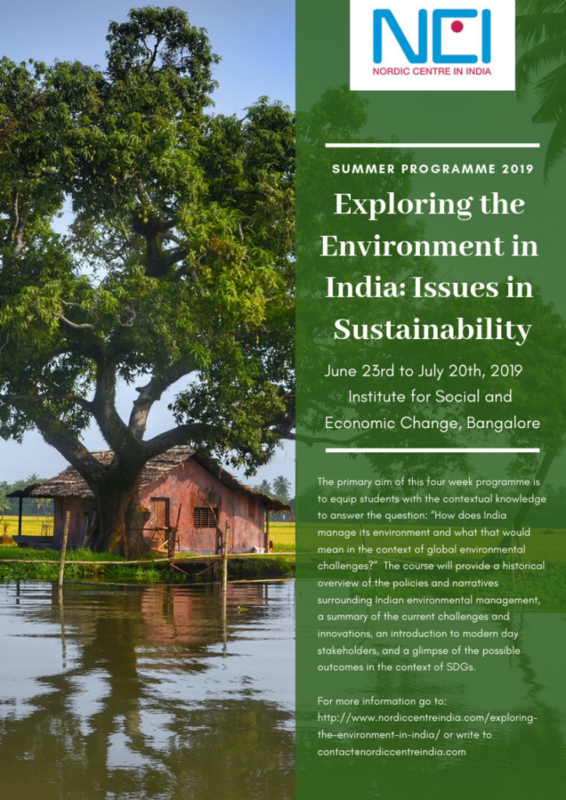 The summer course “Exploring the Environment in India: Issues in Sustainability ” is organized at the Centre for Research in Urban Affairs at the Institute for Social and Economic Change (ISEC) in Bangalore, India. The primary aim of this programme is to equip students with the contextual knowledge to answer the question: “How does India manage its environment?” The course will primarily attempt to provide a historical overview of the policies and narratives surrounding environmental management in India, a summary of the current challenges, a glimpse of the possible options for the near future along with the approaches adopted in managing environment in India. Besides, we have designed the course keeping in view Sustainable Development Goals (SDGs) to match the global agenda. SDG’s aims to eradicate poverty, protect the planet and ensure that all people enjoy peace and prosperity. UNDP aims to strengthen capacities and provide an enabling environment for access to opportunities focusing on the most vulnerable and excluded population groups – in ways that are sustainable from economic, social and environmental standpoints. We, in the course, would like to see to what extent India is able to walk towards that goal. As rightly mentioned all the 17 Goals are interrelated and in the process of achieving one of the goals will tackle the issues commonly associated with the other. However, we have emphasized four goals in terms of priority for this Environment course, around which we will be inviting expertise to deliver lectures, while the other goals will be discussed as they cut across our prioritized goals for the course. Since the other goals are interconnected, for instance, eradication of poverty is related to sustainable management of natural resources through sustainable consumption, education is related to responsible use of natural resources and so on. The other SDG’s will be discussed in relation to the identified 4 prioritized goals in the course. The key SDGs that we will focus in designing the course includes (1) Sustainable Cities and Communities (2) Clean Water and Sanitation (3) Affordable and Clean Energy (4) Climate Action. Philosophical and indigenous underpinnings of traditional environmental management to more modern practices as in policy making and the increasing diverse management styles that have arisen in contemporary India . This course draws content from a variety of sources so as to elucidate comprehensive responses within the above mentioned themes. This will be primarily achieved through lectures from specialists in the field, specific reading material, and field visits so as to make coverage of the topics holistic. The aim of the field visits would be to give the students firsthand knowledge of the topics covered in the classroom and also to interact with various stakeholders that are part of the larger environmental concerns being discussed. This specific course is very field work intensive. Students are taken to field trips in both the city and the countryside where they get to see concepts they are being introduced to in lectures, working in practice. A walk around a ward at Bengaluru (A Ward is an administrative boundary of an urban area). Here students can see the residential areas, interact with people including residents, municipal workers, small business owners, etc., see a public park, visit a slum, watch the rituals performed in a temple, witness Peepal tree worship – part of the cultural tradition, visit a public school, a public health centre, understand how water supply works, get an idea of how solid waste/e-waste, biomedical waste, sewage is managed, etc. Visit to Green Buildings – Green Buildings are eco friendly buildings. Students will be able to interact with experts at the Green building Mr. Vishwanath, Mrs. Chitra Vishwanath and their team at their residence/ office who have designed the spaces meticulously to make it nature friendly. It is a living example of how they have evolved the efficiency standards and harvested solar energy, water, & materials reducing building impacts on human health & the environment, through better siting, design, construction, operation, maintenance, & the complete building life cycle. Visit to a Market (Vijayanagar) place – A visit to a typical urban market will help students get an experience of how the local markets function and appear, and provide a glimpse of how negotiating public spaces is a matter of concern in shrinking urban spaces. Visit to Sukrishi Organic Farm and a village closeby–Sukrishi Farm in Nelamangala is spread across 40 acres of serene landscapes, a natural habitat for birds and animals with variety of trees, crops and herbs. Food grown in this farm are grown organically and served in their traditional restaurant that serves authentic Indian cuisine. Students will also visit a village located close to the farm.Students will get to meet a green entrepreneur Mr. Jayaram who runs a restaurant ‘The Greenpath’ which serves organic food and millets besides promoting natural and simple living through various products in his organic stores. Visit to Terrace Gardens–Students will be visiting some of the terrace gardens that have become popular with the initiative taken by Dr. B.N. Vishwanath, President of Garden City Farmers. Terrace gardens have helped the environment and feed the family with the best organic produce, besides making use of wasted spaces of building roof tops and not adding to the burden of solid waste. Interaction with a Civil Society Group that rehabilitated a local lake– Students will be able to discuss with the civil society organization representatives about the problems encountered, challenges, constraints and the processes by which they were able to come together and organize themselves to achieve their goal in improving the quality of the lake. A letter providing information about previous university studies, expectations and motivations for attending the course, as well as contact information. A certificate of previous studies and a proof of the current registration at the university (a copy of the student card or any other documentation). A CV or other related material to support the application.The admission procedure is conducted by nomination, i.e. after the International offices have received and reviewed the applications they will nominate students qualified for the summer course to the Nordic Centre in India (NCI). Based on the nominations, the NCI suggests students to be admitted and assists them further with the formal admission procedure. The final selection of students is made by ISEC. In case the number of nominees exceeds the maximum number of students who can participate in the course, the NCI and ISEC select students based on their qualifications and university affiliation. The students admitted to the course will be given a letter of admission from ISEC and can apply for study visa through the Indian embassy in their home country. Admission: Master level course that requires 2 years of college or university studies with minimum grades equivalent to 3.0 GPA on a 4-point scale or grade C according to ECTS. Lectures: Three hour lectures in the morning five days a week. On demand a few additional lectures may be organized on topics of interest for students. Field visits: There will be four to five field visits in the weekends or in the afternoon sessions during the first three weeks. Examples of field sites include rural watershed development projects, urban green buildings, community based joint forest management projects, sacred groves, etc. Student seminar presentations: 4 to 5 afternoon sessions during the fourth week.The teachers of the course are researchers from ISEC and invited lecturers from other prominent Indian research institutions and universities alongside practitioners in the field both governmental and non governmental. Upon successful completion of the summer course, the students receive a certificate from the Nordic Centre in India that can award them 7.5 ECTS at their respective home university. For students who wish pursue 10 ECTS it is also possible to do additional assignments during the same period of time. Since the course is designed to suit students from Nordic universities with European and national credit systems, students are requested to consult the International offices for information about how to translate and register the course credits at their home university. Students can find practical information for the programme here and also, here. Address: Centre for Research in Urban Affairs, Institute for Social and Economic Change, Nagarabhavi, 560 072 Bangalore, India.